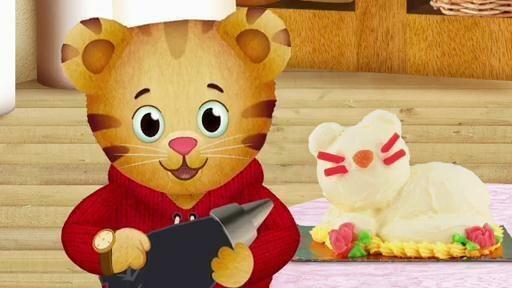 Today is Daniel Tiger’s birthday! Daniel is very excited to go to Baker Aker’s bakery to help his Mom pick out a cake for his party, and so proud that his mom lets him carry the cake himself. But when they arrive back home after a bumpy ride on Trolley, he discovers that his birthday cake is smooshed! What a disappointment. His father helps him see that there are good things even in a smooshed cake – it’s yummy. 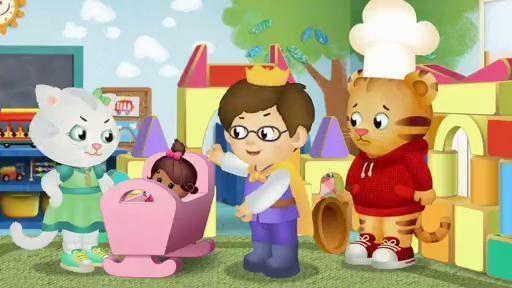 Daniel Tiger and his friends Prince Wednesday and Miss Elaina are having a picnic at the park near the clock factory. When it starts to rain, their picnic is ruined, leaving them very disappointed. 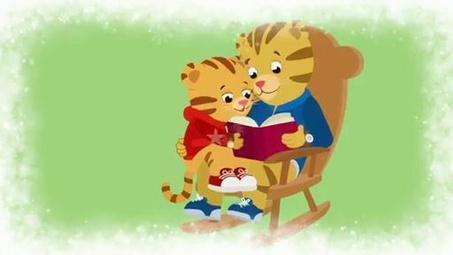 Dad Tiger helps them turn their disappointment around with an inside picnic instead – inside the clock factory where the friends find something else good when they get to hear “chime time” together. The learning goal of this episode is to help children deal with disappointment. The strategy song of this episode is: When something seems bad, turn it around and find something good! Read more on Disappointment: Birthdays & Holidays. Daniel is visiting school for the first time and is a little nervous because he doesn’t know what it will be like there. He packs his backpack with his favorite playthings from home – a lot of things! Teacher Harriet shows him around his classroom, and Daniel is surprised to find so many familiar things there. He learns that asking questions is one way to learn about something that’s new – and to feel more comfortable there. Daniel goes to the doctor for his regular check up. Before his visit, he’s feeling a little uneasy – about one stripe scared, even if he knows he will not need to get a shot. 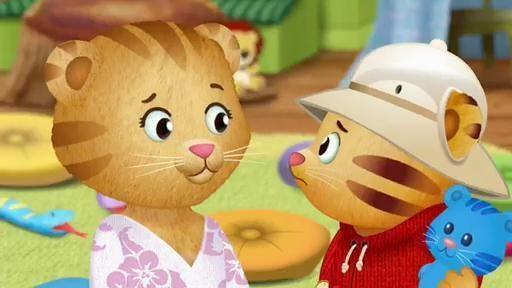 Daniel and Mom Tiger talk, draw and play about some of the things that Dr. Anna will use – a stethoscope, an otoscope, a scale and more. With Tigey and his homemade doctor book in hand, Daniel learns that it also helps to talk with Dr. Anna about what will happen. The strategy song of this episode is: When we do something new, let’s talk about what we’ll do. Read more on Going to the Doctor. The learning goal of this episode is to help children deal with separation. Read more on Adjusting to Preschool. 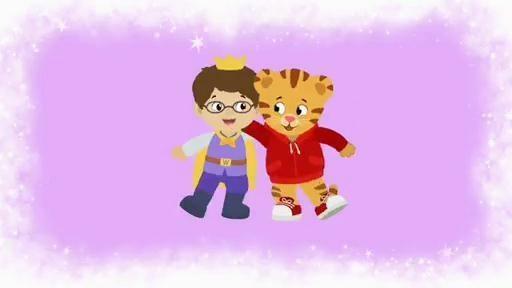 Daniel Tiger and his friend Prince Wednesday are very excited to play at the beach today. 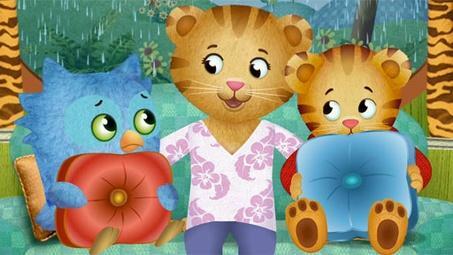 But then it rains, and Mom Tiger says they cannot play outside, making them very mad. 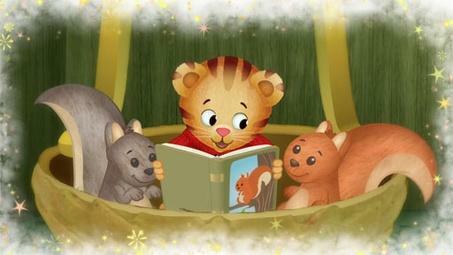 Mom Tiger helps the boys with their mad feelings and find ways to calm down and think. They take a deep breath, count to 4, and that helps them make a grr-ific new plan — to make an inside beach instead! 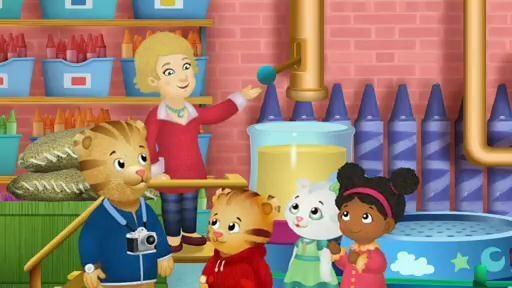 Daniel and his friends are excited to be able to try the new instruments at Music Man Stan’s Music Shop. But Katerina Kittycat really wants to play the triangle. She gets very,very mad when someone else picks the instrument she wants to play. Music Man Stan helps Katerina find ways to deal with her mad feelings – like taking a deep breath, counting to 4 – and then dancing and stomping and singing. The learning goal of this episode is to help children deal with their mad feelings. Read more on Angry Feelings. 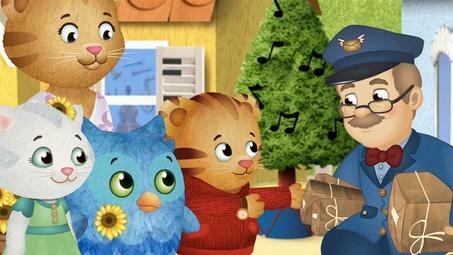 The learning goal of this episode is to help children learn about cooperation. The strategy song for this episode is: Find a way to play together! Read more on Making Friends. Daniel has come to play with Miss Elaina today! They decide to play “outer space,” but Miss Elaina gets upset when her cardboard telescope and spaceship accidentally break. Her mother, Lady Elaine, helps the friends see that they can still have fun together, even without the toys – just because they’re friends! They use their imaginations to keep playing, which is just as much fun! Daniel is visiting Prince Wednesday at the Castle and Daniel is excited about all the things Prince Wednesday has in his room – especially his rock collection. But the rocks aren’t for playing – they’re just for looking. 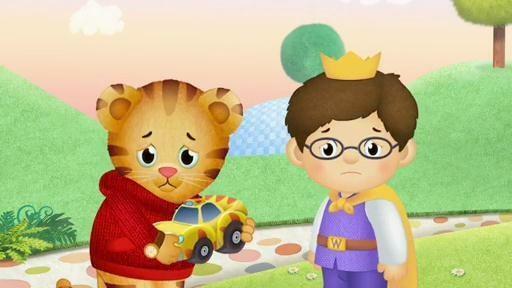 Daniel and Prince Wednesday learn that friendship is about more than just playing with each other’s toys – it’s about being together! The strategy song of this episode is: A friend just wants to play with you. “It’s you I like. It’s not the things you wear. It’s not the way you do your hair. 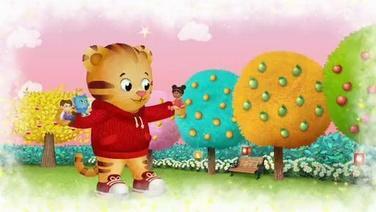 Daniel and his friends are enjoying a Fruit Festival in the Enchanted Garden. Prince Wednesday is upset because his big brother Prince Tuesday can pick the highest fruit off the tree branches, but he can’t. He wishes he wasn’t so little! Then, when the festival-goers spot a very special magical golden pear on the ground, Prince Wednesday is the only one little enough to reach it. 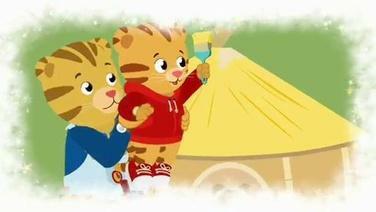 Dad Tiger is building a playhouse, and Daniel wants to help. Daniel is frustrated that he is not big enough to use the grown up tools. 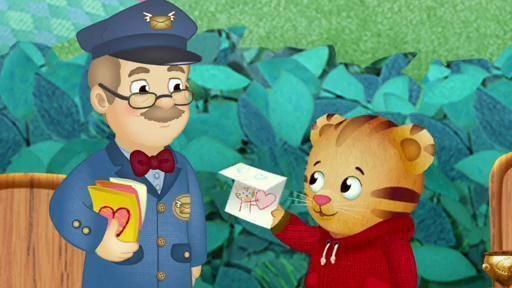 Dad Tiger shows Daniel that there are things he can do to help that he’s just the right size for. 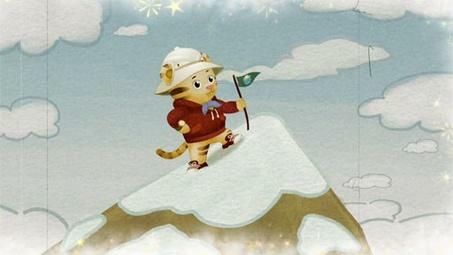 Learning Goals The learning goal of this episode to help children know that even though they are small, there are many things they can do. The strategy song for this episode is: Everyone is big enough to do something. Read More on Valuing Little and Big. The learning goal of this episode is to help children find ways to manage when they have to wait. 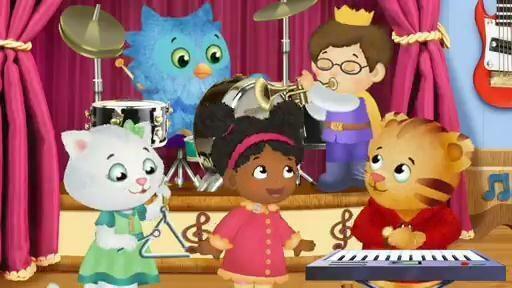 The strategy song of this episode is: When you wait, you can play, sing or imagine anything! Read more on Taking Turns. 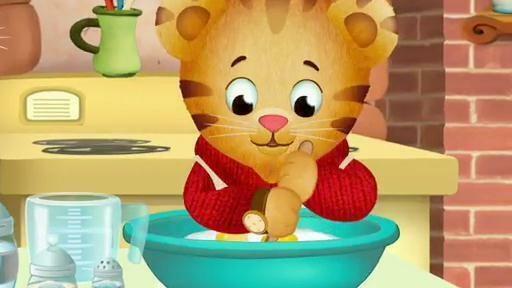 The Tiger family is going to Clock Factory Park today to hear a big announcement from King Friday. Daniel has to make several choices throughout the day, culminating in one BIG group decision: King Friday announces that the children can choose one new piece of playground equipment by voting for the one they want. At school Daniel and his classmates get to choose their new class pet. Teacher Harriet explains that they can either get a bunny or a turtle. The children learn what it means to ‘vote’ and that sometimes it doesn’t always turn out your way. Each of the children find something to love about their new pet, ‘Snowball’! 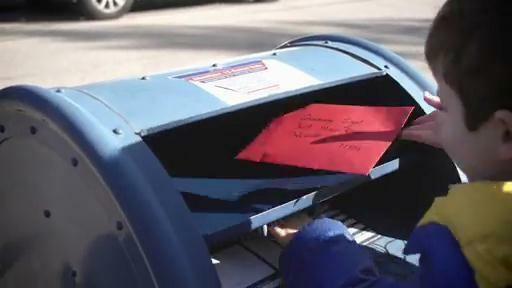 The learning goal of this episode is to help children understand what it means to vote. The strategy song of this episode is: Stop, Think and Choose. 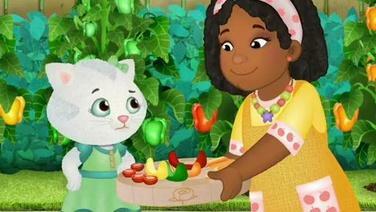 Teacher Harriet introduces Daniel and his friends to the school’s vegetable garden and asks them to help her pick out some healthy vegetables for their snack. They explore the garden, picking and trying different vegetables…but not everyone is eager to taste the new foods. 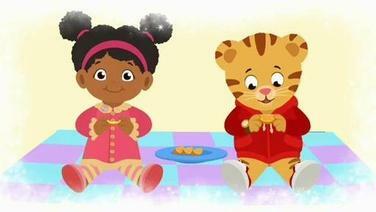 Miss Elaina is having dinner with the Tiger family and she encourages Daniel to try some new food: Vegetable Spaghetti and Banana Swirl. Daniel is convinced he won’t like Veggie Spaghetti, even though he’s never tried it before. Miss Elaina encourages him to be adventurous and try the new food. She does the same herself, and even though she doesn’t like all of it, she’s proud of herself for trying. The learning goal of this episode is to encourage children to try new foods. The strategy song of this episode is: Try a new food, it might taste good! It’s a typical morning in the Tiger household, and Daniel has to get up and get ready for school, but his playing and imagining distract him from his routine. 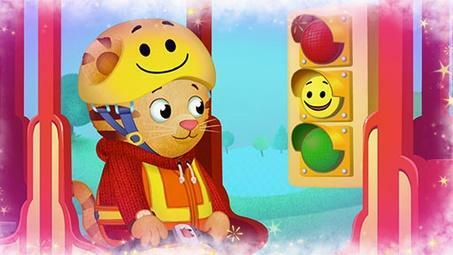 Daniel learns that his morning routine helps him be ready in time for Trolley to take him to school. Tonight, Daniel is pretending to be Super Daniel! But after dinner, he has to follow his nighttime routine even though he would rather play. Young viewers follow Daniel as he gets ready for bed and learns that even superheroes get sleepy and go to bed, too. 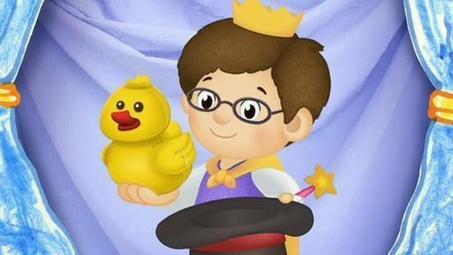 The learning goals for these episodes are to help children with daily routines – morning and bedtime. Clothes on, eat breakfast, brush teeth, put on shoes and off to school! Bedtime! 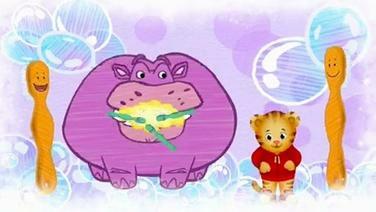 Bath, brush teeth, pjs, story and a song! Daniel has an appointment at the doctor today and he has to get a shot. He is very apprehensive and does not want to go. 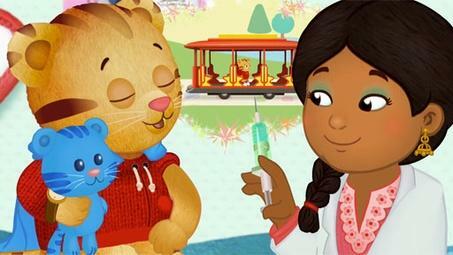 So Daniel asks Mom Tiger questions about the shot, and she shares her trick for staying brave in scary situations. And Daniel finds that the shot was not so bad after all! 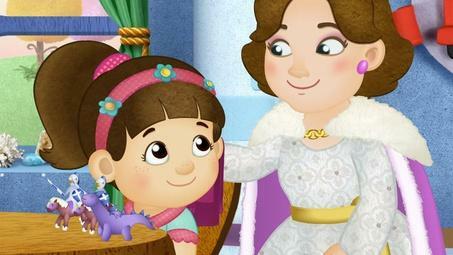 The learning goal of this episode is to help children better manage their fears by feeling brave and strong. The strategy song of this episode is: Close your eyes and think of something happy. There are many times in life when we can’t solve our children’s problems or get rid of their fears. Perhaps all we can do is to provide a safe, loving place and a willingness to listen while children work through whatever is bothering them. Read more on Children and their Fears. Daniel goes to his friend Prince Wednesday’s for a sleepover. They brush and wash and get ready for bed, but as they get ready to go to sleep they notice some things that could be just a little bit scary. Once they investigate further, they learn the things they are seeing actually aren’t scary at all! Daniel and O the Owl are camping in the backyard with Dad Tiger. This is O’s first time sleeping in a tent and he is feeling a little unsure. Once he examines this new setting closely, he learns that it’s not so scary! In fact, different can be fun! 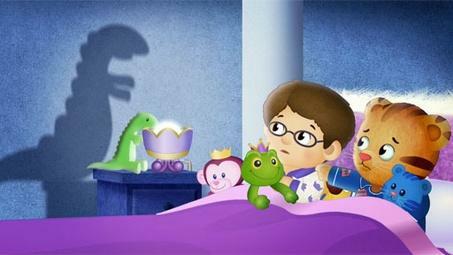 The learning goal of this episode is to help children with nighttime fears. Strategy Song: See what it is, you might feel better. The children are putting on a show at school today, each doing something that makes them special. O the Owl wants to be just like the others but, with a little encouragement, he learns that there are things that make him special, too. Daniel and Dad take a walk through the neighborhood, admiring the colors of the leaves. 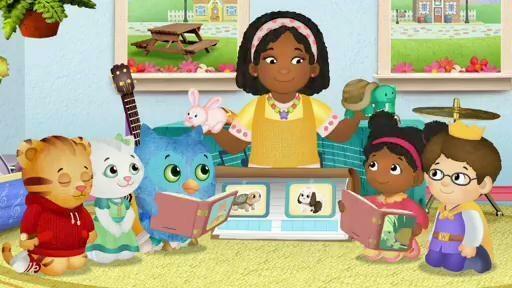 On their way, they meet Miss Elaina and O the Owl who each do special things that make Daniel wonder if he is as special as they are. Dad reminds Daniel of the things that make him special, like his whimsical imagination! The learning goal of this episode is to help children appreciate their uniqueness – and the uniqueness of others. A wind storm has made a mess of the Neighborhood playground and no one can play. 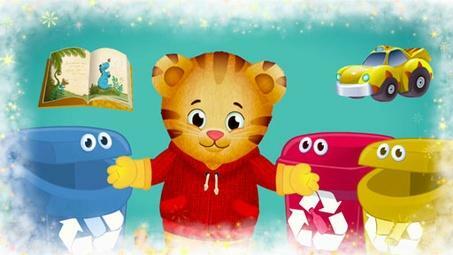 When King Friday proclaims that it is Clean Up Day, everyone helps by throwing away and recycling the trash. The children learn that they can all work together. 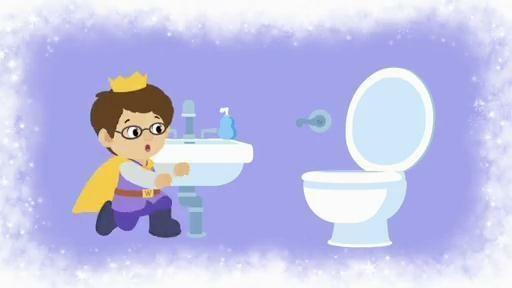 The learning goal of this episode is to help children know that cleaning up is everyone’s responsibility. Clean up, pick up, put away, clean up every day! Read more on How to Engage Children in Clean-up. In school the children are all helping Teacher Harriet with a big art project: creating a dancing dragon! Everyone is eager to finish so the dragon can dance, but they learn that they need to work together so the big project can be finished. It is Teacher Harriet’s birthday and the children want to surprise her. 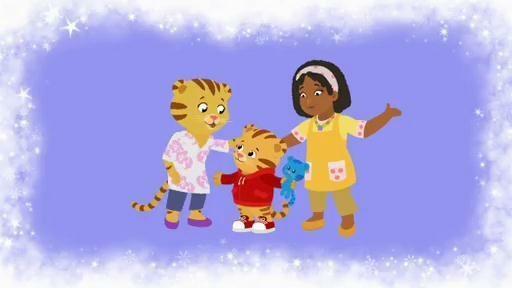 Mom Tiger helps them decorate the classroom with streamers and the children learn that they need to work together to make a special birthday present surprise. The strategy song of this episode is: Work together! If you can’t do it alone, work together! Daniel and Grandpere are at home pretending to be superheroes when Daniel notices that Dad has forgotten to take his lunch to work with him. He and Grandpere take Dad’s lunchbox to the Clock Factory and Daniel uses his imagination to have super adventures along the way. 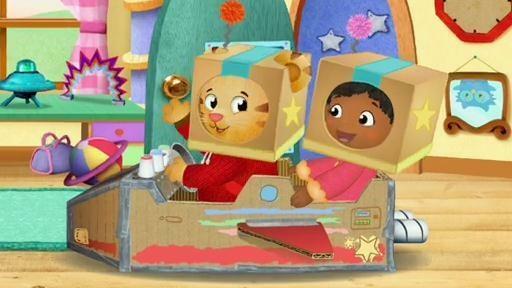 The learning goal of this episode is to help children know that it can be lots of fun to pretend. The strategy song of this episode is: When you pretend, you can do anything! Read more on Encouraging Pretend Play. Episode 125: Daniel Uses his Words/ All Aboard! Daniel is having lots of fun playing “farm”, until, as Mom Tiger is cleaning up, she accidentally ruins Daniel’s game. Grrr! Mom helps Daniel use his words to tell her how he is feeling so she can understand why he is upset. 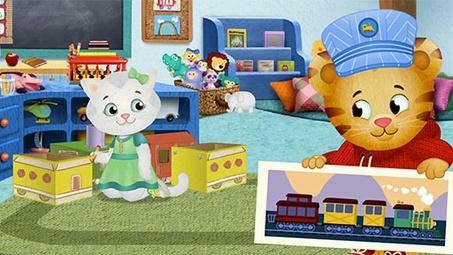 Daniel and his friends are playing “train” at school, but things aren’t going Katerina’s way. Meow! Katerina learns that others will not be able to help her if they don’t understand why she is upset. 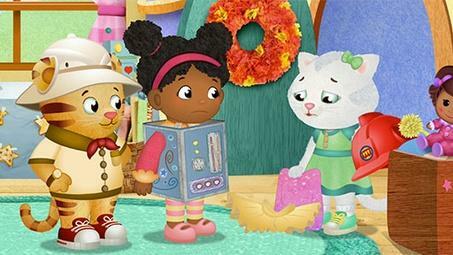 She finds a way to use her words and her friends find ways to help so that they can all play together! 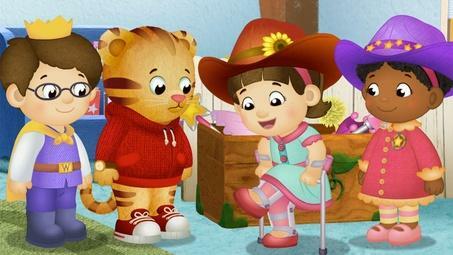 The learning goal of this episode is to help children use words to express what they are feeling. The strategy song of this episode is: Use your words. Daniel, Katerina and Miss Elaina are playing cars at school, until Miss Elaina accidentally upsets Daniel. 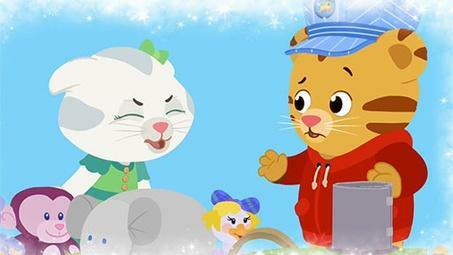 Teacher Harriet helps the children learn how to apologize to a friend. Later, when Daniel accidentally upsets Katerina, he knows just what he needs to do. Daniel and Prince Wednesday are making sand pies in the sandbox. They decide to top off a sand pie with Prince Tuesday’s royal crown, but they soon see that this wasn’t such a good idea. They learn how to apologize to Prince Tuesday and make the situation better – by helping clean the crown and promising to ask first next time. The learning goal of this episode is to help children better understand what being sorry means. The strategy song of this episode is: Saying I’m sorry is the first step. Then, how can I help? 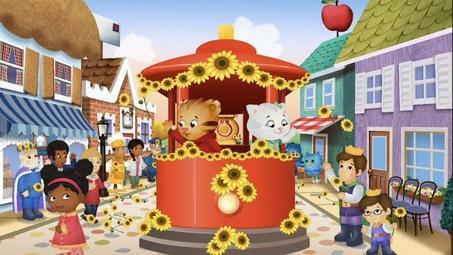 Calm at the Clock Factory Daniel and his friends are visiting Dad Tiger’s Clock Factory. Daniel’s excitement to show off his dad and the tigertastic clocks is making him a bit silly. He learns that there are places to be calm and places where it’s OK to be silly! Calm Before Story Time The kids are going to the Neighborhood Library for story time! All the excitement has made them feel a bit silly. Prince Wednesday has a hard time getting calm for the library, but learns that there are places to be calm and places where it’s more than OK to be silly! 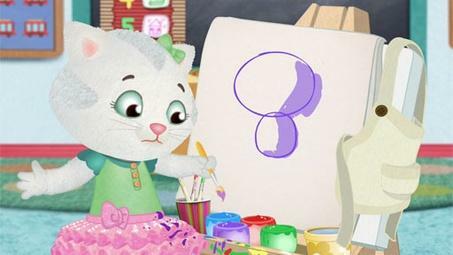 The learning goal of this episode is to help children learn to calm themselves down. 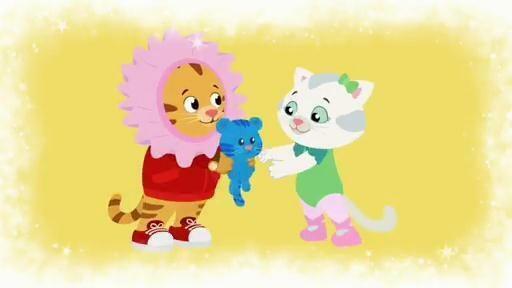 The strategy song of this episode is: Give a squeeze nice and slow, take a deep breath and let it go. Read more on Noisy Times and Quiet Times. 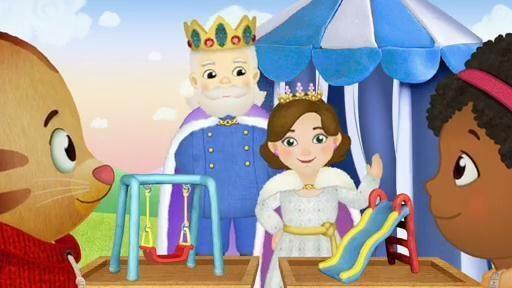 Daniel and Katerina are at Miss Elaina’s Museum-Go-Round to make their costumes for Dress Up Day. While Daniel and Miss Elaina know exactly what they want to be, Katerina is having a harder time deciding on just the right costume. Eventually she comes up with a very clever idea! It’s Dress Up Day in the Neighborhood of Make-Believe and it’s time for the annual main street parade! The children visit all the stores, showing off their fancy costumes and receiving different stickers from their neighbors. 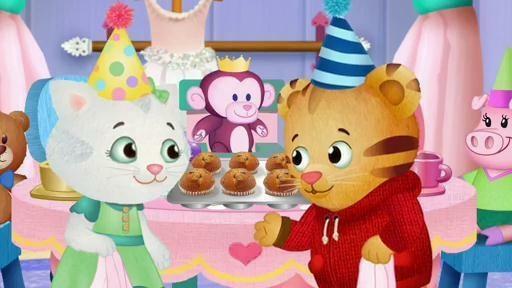 The learning goal of this episode is to encourage pretend play and help children see that dressing up can make play even more fun. Strategy song of this episode is: Dress up any way you choose. Find a way that’s right for you! Read more on Dress Up Play. 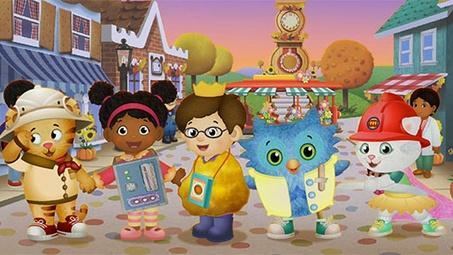 It’s Time to Go: Daniel, O the Owl and Katerina are playing “library” at the Treehouse. When it’s time for them to go home, Katerina and Daniel don’t want to stop playing because they are having so much fun! They learn that choosing one more thing to do before they leave makes their transition a little easier. Daniel Doesn’t Want to Stop Playing: Daniel is playing “Trolley” with Mom and Dad in the living room. When Mom tells him that it’s time to work on his school project, Daniel doesn’t want to stop playing. Mom helps Daniel by allowing him to pick one more thing to do with his toy Trolley. After Daniel makes one last stop, he’s ready to work on his school project. The learning goal of this episode is to help children learn to stop what they are doing and prepare for what’s coming next. The strategy song of this episode is: Part 1: It’s almost time to stop, so choose one more thing to do. Part 2: That was fun, but now it’s done, it’s time to…(add words stating whatever it is you want your child to do next). Read more on Helping Children Learn to Stop Themselves. Today at school, the kids are playing with traffic signs. Prince Tuesday comes for a special visit, wearing his crossing guard uniform. 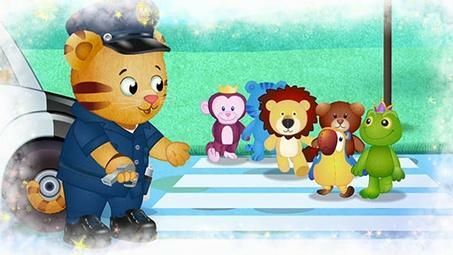 He takes the class on a walk through the neighborhood, and they practice their safety rules along the way! 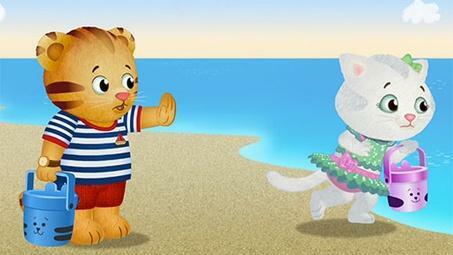 It’s a beautiful day in the neighborhood, so Mom Tiger takes Daniel and Katerina to Jungle Beach to play. The children get a bit carried away during their treasure hunting play and drift a bit too far away from Mom Tiger. She reminds them that to stay safe near the water, they need to stop and listen! 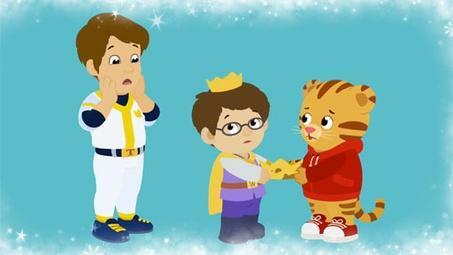 The learning goal of this episode is to help children pay attention to rules and learn how to keep themselves safe. The strategy song of this episode is: Stop and listen to stay safe. The learning goal of this episode is to help children understand that doing something kind for others can make them feel good too. The strategy song of this episode is: Do something nice for your neighbor, do something nice for your friend. A Snowy Day: It’s a snowy day in the Neighborhood, and Miss Elaina is coming over to play! 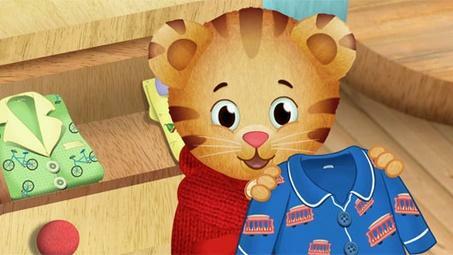 Mom Tiger helps Daniel change out of his pajamas into clothes that will keep him warm. When it’s time to go outside, Daniel learns how important it is to choose the appropriate clothes. Tutu All the Time: Katerina is wearing her favorite sparkly tutu at school today! She likes to wear it all the time, even when she’s painting and playing “grizzly bear” with her friends. But she soon learns how important it is to choose the appropriate clothes for the things you want to do. 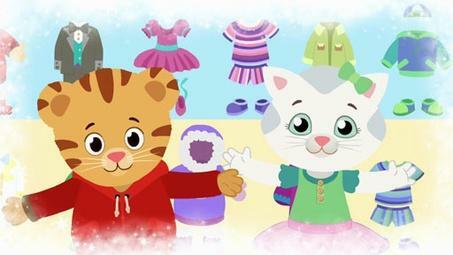 The learning goal of this episode is to help children think more carefully about the clothes they choose to wear. The strategy song of this episode is: Think about what you’re going to do, then pick the clothes that are right for you. Read more on Giving Children Choices. Duckling Goes Home: Today at school, the kids learn that Ducky has grown too big for their classroom, and it’s time to take him back to the farm. Daniel and Miss Elaina are quite upset about the news. The children cope with their sadness in different ways, and they feel better –little by little. 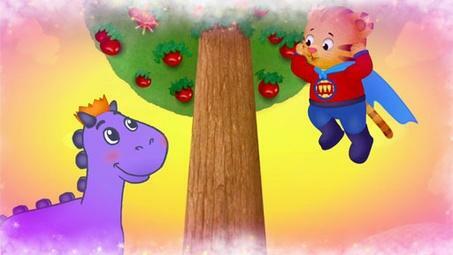 Daniel Feels Left Out: On their way home from the neighborhood grocery store, Dad and Daniel stop by the tree house. O the Owl and Katerina Kittycat have been playing together all day, and are even having dinner together! Daniel feels left out. 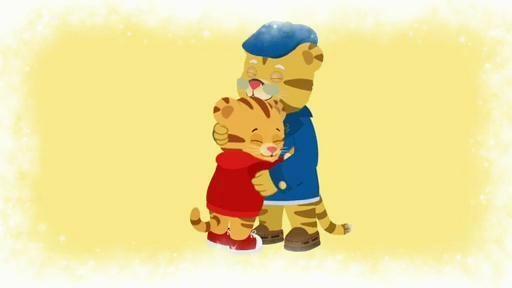 Mom and Dad Tiger help Daniel cope with his sad feelings, and he feels better-little by little. The learning goal of this episode is help children identify feelings and learn ways to manage them. The strategy song of this episode is: It’s ok to feel sad sometimes, little by little you’ll feel better. 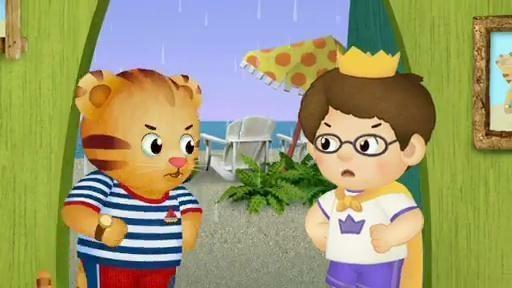 Daniel Gets Frustrated: Daniel is playing at home with Mom Tiger today, but nothing seems to be going his way. He can’t do what he wants to do, and this makes him feel frustrated! With help from Mom Tiger, Daniel learns how to manage his frustration, and thinks of new ways to play. Frustration at School: Daniel and his friends are playing ‘restaurant’ at school today. Daniel feels frustrated when he can’t find what he is looking for. Luckily, he learns to cope with his frustration by taking a step back and asking for help and soon dinner is served! The strategy song of this episode is: When you’re frustrated, take a step back, and ask for help. Daniel is Jealous: Daniel and Katerina are playing “airplane” with Grandpere. Daniel thinks Katerina is getting too much attention from Grandpere and starts to feel jealous. Daniel explains his feelings and is reassured that he is Grandpere’s one and only Daniel. 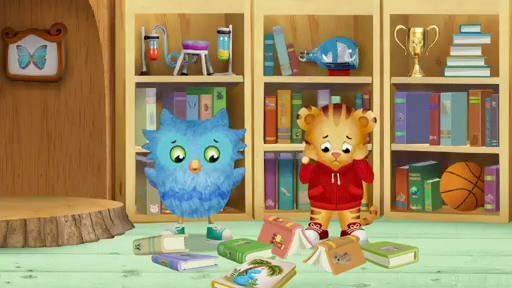 Jealousy at the Treehouse: Daniel and Katerina are at O the Owl’s house today, playing with his new science kit. 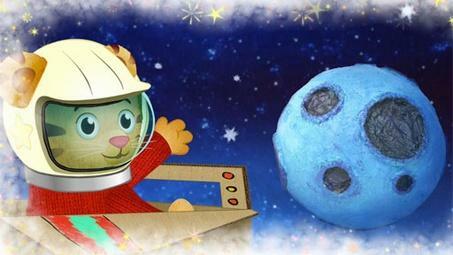 Daniel and Katerina feel jealous of O because they want science tools just like his. After talking about their feelings, the children realize how they can all enjoy O’s special science kit. The learning goal of this episode is to help children identify, express, and manage their feelings. The strategy song of this episode is: When you feel jealous, talk about it. Language pays a key role in helping children deal with their feelings. Feelings are a part of being human. Of course, talking about feelings can be a challenge for people at any age, even more so, for young children who don’t use words well, especially when they are upset. Sometimes feelings can be a jumble inside and are hard to sort out or name. That can be one of the times when children find it most difficult to tell us how they feel. We need to encourage children to talk about their feelings. Being able to use words to describe what they are feeling gives children power over their feelings. Giving words to feelings can make them become a lot less overwhelming or upsetting or scary. When children can talk about their feelings with you, they can learn that their feelings are natural and normal, and that others feelings, too. Give your child the words to use to express how they feel—“I’m sad,” “I feeling jealous,” “I’m tired,” and “I’m mad.” When children can begin to express themselves with words, they are less likely to bite, hit, kick or use some other disruptive behavior. 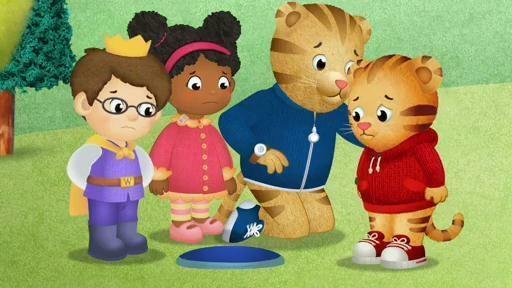 Daniel Learns about Empathy– Using their play toolkits, Daniel and O the Owl are pretending to make “repairs” to Daniel’s playhouse. Daniel is having lots of fun hammering loudly, but it’s upsetting O, who would rather do something quieter. Daniel loves hammering so much that it’s hard for him to see why it upsets O. Mom helps Daniel think about how O is feeling. He comes to realize that they can both have fun as quiet handymen! 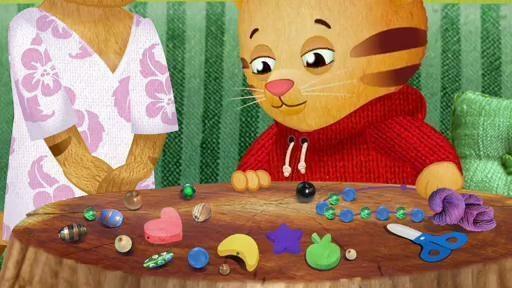 Empathy at School– Chrissie and Daniel are playing “doctor” at school today, but when Chrissie loses her special bracelet, she doesn’t feel like playing anymore. Daniel has trouble understanding why. Teacher Harriet helps him understand how Chrissie may be feeling. Daniel remembers how worried he was when he thought Tiger was lost, and decides to stop playing and help find the bracelet. 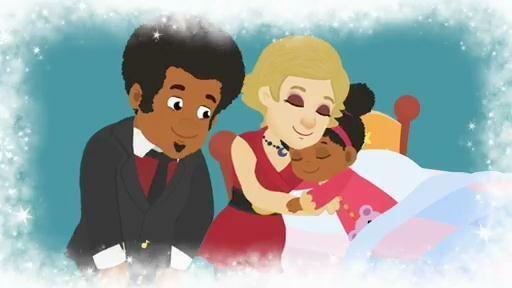 The learning goal of this episode is to help children develop caring attitudes toward others. The strategy song of this episode is: Think about how someone else is feeling.